While Jenni "JWoww" Farley and estranged husband Roger Mathews can put aside their differences to spend time together with their kids, she has moved on from their relationship. The 33-year-old Jersey Shore star posted on her Instagram Story on Friday an image of her holding a glass of red wine while she had lunch with an unidentified person on a terrace overlooking a marina. On Sunday, she shared on Snapchat a selfie video showing her riding in a car with what appeared to be a man, whose arm is shown. She captioned the clip, "Weekend vibes." "JWoww has moved on," her rep told E! News. In December, she filed a temporary restraining order against him after an argument and police removed him from their home. 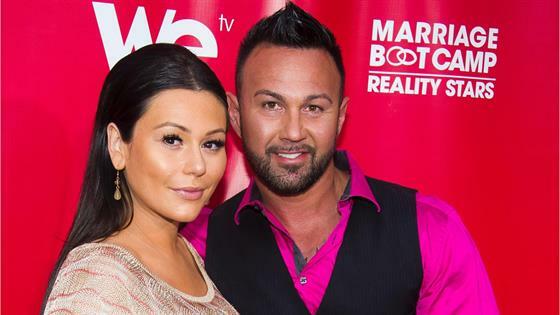 In February, JWoww released a statement in which she accused Matthews of physical abuse. He said she had posted "many lies" about him. He later admitted to pushing her one night, while accusing her of showcasing violent behavior herself. "Please let's stop the madness," he said. "Let's both get help. For our children. We owe them that. I am not an abuser Jenni and you know it. We look like a--holes to the world. We are. We are both a--holes."